Sheldon’s 2014 Fifteen (Plus Five) Movies! After careful consideration – and with some trepidation – I’ve finally put together my final list of my favorite movies from 2014. It was the first time in a long while that I saw more than 200 movies and a lot of them were incredibly good (a lot were incredibly bad, or boring, but I’ve already dealt with those). As usual, these are the films that got me laughing, crying, engaged in conversations and generally made my brain fizz in a good way. As usual, anyone who says it was a crap year for movies just wasn’t paying attention. Also note that two movies – Selma and Boyhood (despite their importance in terms of history and/or unique concepts) did not make my favorites list – not because they were bad films. They were not. They were very, very good ones. They just didn’t connect with me as much as these twenty did. 20. Automata – a look at the evolution of artificial intelligence that suggests it might happen the way it did for Homo sapiens, but set in a post-apocalyptic world where humanity has already screwed things up to the point that AI can’t possible do a worse job. This is the movie that I, Robot desperately wanted to be (and was shot on that film’s craft services budget). Best thing Antonio Banderas has done in eons. 19. The Grand Seduction – a tiny Nova Scotia village tries to persuade a big city doctor to relocate so that the town can gain funding to rejuvenate its economy. Directed by Canadian legend Don McKellar and starring Canadian legend Gordon Pinsent and Canadian Taylor Kitsch, this is a quietly charming, slightly eccentric work that delights from start to finish. 18. LFO – Scientist discovers mind control through a combination of four tones; uses same to fulfill his wildest fantasies but find that to be hollow. Sets his sights higher. Dark sci-fi satire with seriously black humor and an ending that, after you get over the shock, makes complete sense. 17. Chef – a voyage of self-rediscovery by a chef who tires of being unable to create the menu he wants and takes to the road, with his estranged son in tow, for the summer. John Favreau returns to his indie roots with a movie that satisfies like a good meal. 16. Captain America: The Winter Soldier – the Three Days of the Condor of superhero movies. Relevant (to the point that it got Robert Redford to play a major role) and dark. The movie that had more than one critic saying that Marvel movies had just grown up. More importantly, it never forgot to make its relevancy impressive fun. 15. Veronica Mars – this crowdfunded gem had to do two things equally well: satisfy fans of the cult TV hit of the same name, and entertain an audience that never saw the TV series. It did both with panache in a neo-noir thriller that mixed smart and cool – and proved that things don’t really change after high school. 14. Edge of Tomorrow – Groundhog Day on a battlefield. Super cast, skilfully muscular direction, smart, smart script based on a first-rate Japanese novel. Tom Cruise gets full credit for his acting here, sparking off a terrific performance from Emily Blunt. 13. The Book of Life – an animated classic-in-waiting based around Mexico’s Day of the Dead holiday and the romance between a military hero, a bullfighter/ would-be musician and a beautiful, intelligent woman. Unique in its style and approach, fresh in its design and utilizing 3D better than most animated films of the last decade, The Book of Life is a colorful, life-affirming film that entertains ferociously. 12. The LEGO Movie – we expected a 90-minute infomercial and got an almost two-hour satire that spoke the languages of kids and adults perfectly. The film simultaneously showed that individual effort and imagination and working as part of a team both have their places – and that everything is, indeed, awesome. 11. 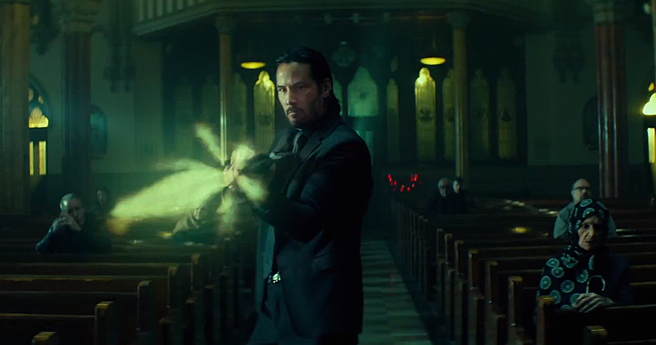 John Wick – best action movie of the year, John Wick’s titular character gave Keanu Reeves his coolest character in years and added world building details that allowed the film to feel different from the usual band of revenge flicks. In another unusual twist, the villain’s number one guy was more dangerous than the villain. If there’s ever a sequel, I’m there! 10. A Most Wanted Man – one of Philip Seymour Hoffman’s last films, this quietly tense espionage movie – yet another adaptation of a John LeCarré novel – kept its audiences on the edge of their seats not by being violent, but by put its very real characters in unremittingly tense situations. Plus, if you hadn’t read the book, I can guarantee you didn’t see that ending coming. 09. Big Hero 6 – finally, we get to see what a Marvel superhero movie looks like in 3D CG – and it looks pretty good. A story of life, loss and redemption with unlikely heroes in the persons of a soft robot health care nurse, a mourning teenager and a collection of science nerds, Big Hero 6 mixes standard superhero tropes with well-drawn (in every sense) characters. Also, Stan Lee’s best ever cameo. 08. Life Itself – the warts-and-all biographical documentary about Roger Ebert – taken from his autobiography of the same name. From the director of Hoop Dreams, Life Itself may be the story of Ebert’s life, but it’s also the story of how movies can change a person. Simply brilliant. 7. Nightcrawler – if ever there was a movie that could shake you up, this is it. After seeing Jake Gyllenhaal’s sociopathic, self-help book/website-inspired creature of the night, you will never look at your local news footage the same way again. Guaranteed. 6. Citizenfour – the documentary that follows Edward Snowden as he makes the decision to blow the whistle on the illegal and immoral activities of the NSA that ignored the constitutionally guaranteed rights of not only every citizen of the United States but a substantial portion of the rest of the world. Important and ground-breaking as it happened coverage from the POV of Snowden, the journalists he worked with and Laura Poitras and her tiny crew. 5. 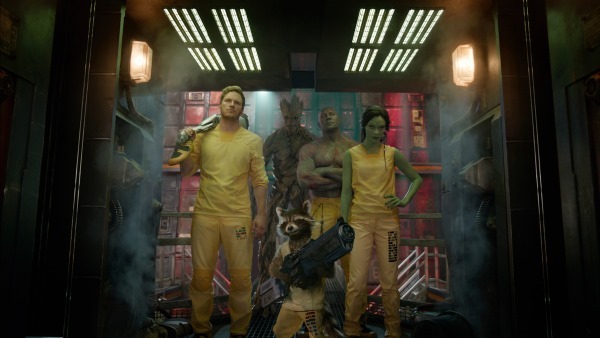 Guardians of the Galaxy – the second most fun I had at the movies this year. GotG, the Marvel Cinematic Universe movie that was based on a comic virtually no one had ever heard of, from a director best known for writing the Zack Snyder remake of Dawn of the Dead and writing/directing horror/satire Slither. A Star Wars for the 21st century – epic fun, 10,000/10 points for style, and the coolest CG characters ever. Sometimes pure fun is all you need. 4. The Imitation Game – the story of Alan Turing, the man who beat the Germans’ Enigma Machine during WWII (essentially by designing and building a computer) and then had to submit to chemical castration after being convicted of homosexuality (one of over 49,000) when it was still a crime and, within a few years, committed suicide. Benedict Cumberbatch is brilliant as Turing and more than ably supported by Keira Knightley, Charles Dance, and more. 3. 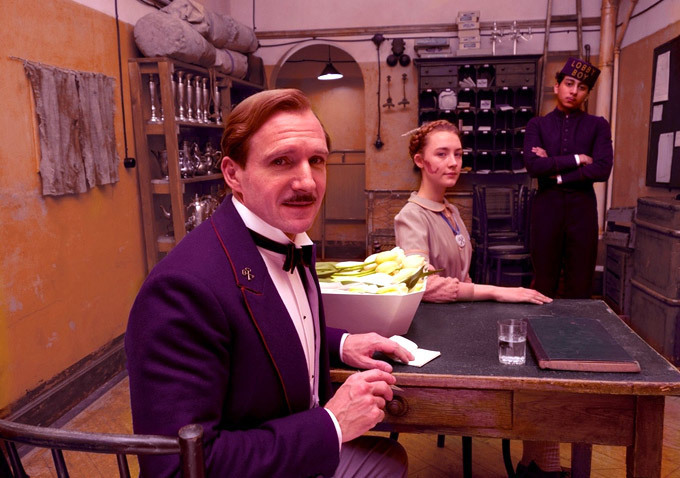 The Grand Hotel Budapest – Wes Anderson takes inspiration from the fiction of Stefan Zweig and creates a story of one of the last bastions of civilization in a world going slowly mad. Set in the world of pre-WWII, Gustave H. is the concierge of the titular hotel and a fastidiously correct individual who attempts to instill his sense of propriety to new lobby boy, Zero. There’s a murder; a stolen painting; a sweet romance; villainous villains and a misguided cop lurking amongst the details of Anderson’s sweetest confection yet. The most fun I had at the movies all year. 2. Birdman or (The Unexpected Virtue of Ignorance) – the star of a series of superhero movies twenty years earlier tries to prove his talent by mounting an impossible play while dealing with many egos (including his own). Birdman serves as a dark satire on everything about the movie biz – the bean counting deliberateness that spawns a world of superhero movies; the way talent is ignored if it comes from the wrong sources; the potential for critics to abuse their craft and the way such a nomadic industry can affect family. 1. 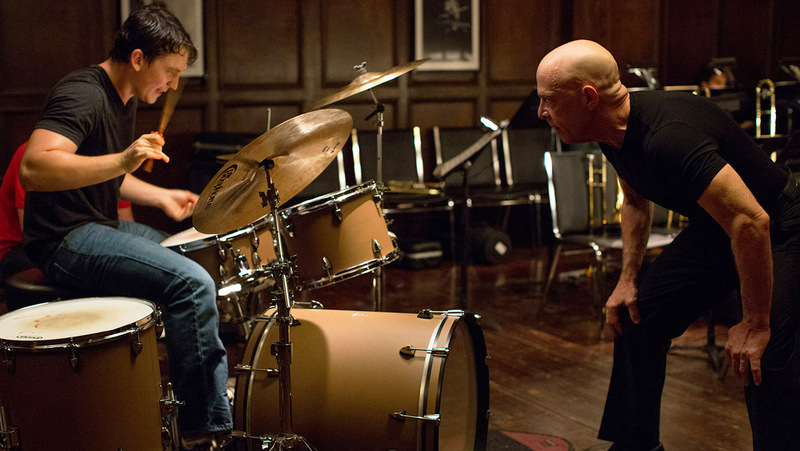 Whiplash – a drumming prodigy seeks greatness by joining a jazz band at a prestigious music school and faces all manner of abuse from the band’s conductor (who has his own agenda). What price are we willing to pay for greatness? Is that price ever too much? Who decides? This was the film that I couldn’t stop thinking about for weeks afterward. Honorable Mentions (in the order in which they popped into my head): Journey to the West, Project M, The Theory of Everything, Selma, The Wind Rises, Boyhood, Into the Woods, Wild, Top Five, Gone Girl, Out of Mind Out of Sight, The Equalizer, A Walk Among The Tombstones, Heaven Adores You. NB: Thanks to the folks at the Calgary International Film Festival without whom I wouldn’t have seen several of the above films during their actual year of release.